It’s not the best movie ever made in Paris. Nor is it the best movie made by either of its stars or its director. And yet, with its stylishness and wit, it remains watchable when so many other movies from the 1960s seem hopelessly dated. 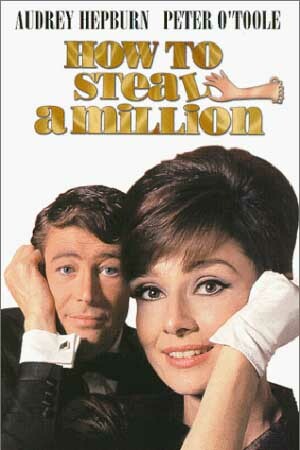 I am talking about How to Steal a Million, 1966, directed by William Wyler and starring Audrey Hepburn and Peter O’Toole. For one thing, of the various movies that Audrey Hepburn made in Paris (such as Funny Face, Love in the Afternoon, Charade, or Paris When it Sizzles), she finally got to act with someone close to her own age. Fred Astaire, Gary Cooper, Cary Grant, and William Holden were all much older than she was; but with Peter O’Toole she had a believable love interest. For another, the movie doesn’t try to be more than it is – an enjoyable romp. There is no violence (as in Charade) or singing and dancing (as in Funny Face) or hectic fantasy (Paris When it Sizzles) or torrid affair (Love in the Afternoon) to spoil the enjoyment. It’s just an amiable caper – a heist that is not really a crime, with some light-hearted romance woven in. The plot is quite simple. Audrey plays Nicole Bonnet, the daughter of a gifted art forger, Charles Bonnet. Charles Bonnet makes the mistake of lending a forged sculpture of Venus to a famous museum for a blockbuster exhibit. Meanwhile, a specialized art detective called Simon Dermott (O’Toole) is closing in on Bonnet. Nicole surprises Dermott one night when he sneaks into the Bonnet mansion to take a paint sample from a forged Van Gogh. She assumes him to be a burglar. When the museum tells the Bonnets that the sculpture must be subject to expert scrutiny before it can be insured, Nicole contacts the man she thinks is a professional thief to help her steal it back. Dermott is falling for her, so he agrees to help her. The small statue is protected by a sensitive burglar alarm and Dermott conceives a plan to set off the alarm repeatedly, until the guards assume that it is malfunctioning and turn it off. The plan works. Dermott grabs the statue. Dressed as a cleaning lady, Nicole smuggles it out of the museum in a bucket. Dermott sells the statute to an eccentric collector who agrees never to display it in public. Then he and Nicole head off in his pale yellow E-type Jaguar to live happily ever after. Audrey Hepburn was happy to work again with director William Wyler, who had brought her to fame in 1953 in Roman Holiday (another delight, but with another older man). For his part, Peter O’Toole was hoping for a break from the intensity of his previous films, Lawrence of Arabia and Becket. In preparing for How to Steal a Million, he watched Cary Grant movies to get the hang of the debonair man-about-town character. 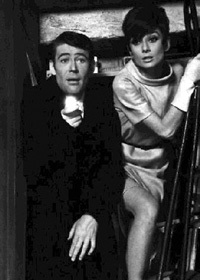 Although the movie starts with an auction, followed by the delightful sight of Audrey dressed in head-to-toe white Givenchy, driving a tiny red Italian convertible (Norman tells me it is an Autobianchi Eden Roc) across the Pont de la Tournelle, the first scenes to be filmed were, in fact, those in which Audrey and Peter are scrunched up in a museum broom closet as they carry out the heist. This part of the film took eleven days to film, and according to one of Audrey’s biographers, the two stars kept getting fits of the giggles and spoiling take after take by laughing. Fortunately for everyone’s nerves, the film was shot on the “French schedule.” In Los Angeles, filming starts at 9 a.m. or earlier and usually wraps up in the early evening, with a break for lunch, largely so that the technicians involved can keep regular hours. In France at the time, filming never began before noon and continued until 7:30 without a break, to allow for a civilized dinner at 9 p.m. William Wyler found this arrangement congenial and added, “Who can play a love scene at nine o’clock in the morning?” No doubt O’Toole, a notoriously heavy drinker, also appreciated the schedule. Audrey never drank on the job, but at one point the weather turned chilly during an exterior shoot, and O’Toole offered her some brandy. The next scene called for her to roar off in the Autobianchi, which she did, knocking over several large lamps and sending the lighting crew diving for cover. The interiors are a different story. They were constructed on the studio lot at Boulogne-Billancourt. The set designer, Alexander Trauner, who lived in Paris, contacted several Paris painters to create the “masterpieces” that line its walls. For $100,000 he amassed a collection of fake Renoirs, El Grecos, Goyas, Rembrandts, Rubenses, Van Goghs, Monets, Cézannes, Tintorettos, and Picassos. For another $50,000, he bought authentic antique frames. The fake artwork was so attractive that real thieves helped themselves to several objects during the filming. While in Paris, Wyler took a house on the rue Weber, where he and his wife could entertain. 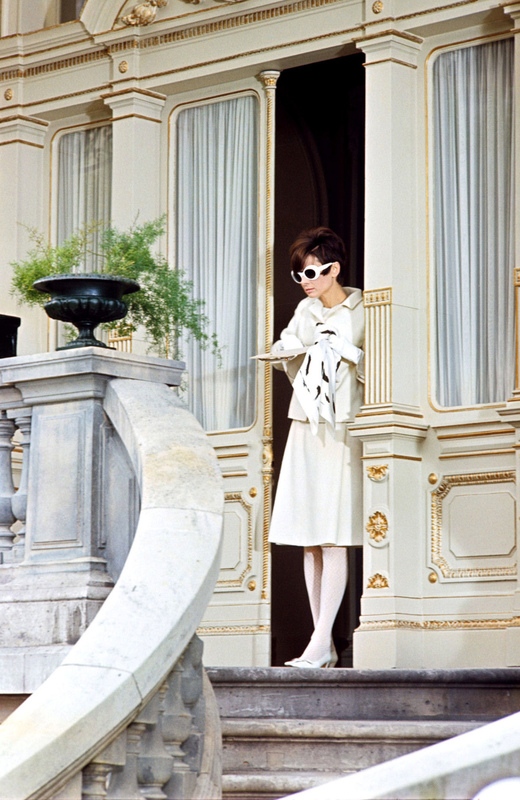 Audrey Hepburn stayed at the Hotel Raphael (returning to her family in Switzerland on weekends), and O’Toole bunked at the Hotel George V. But the hotel featured in the movie was the Ritz, where Dermott stays while investigating Charles Bonnet. When Nicole finds out he is there, she figures that he must be a very successful burglar indeed. They begin to plan the heist at the hotel, in a scene in which Audrey wears a black lace Givenchy number with black lace stockings, a black lace eye veil, and glittering silver eye shadow. Peter O’Toole’s character does a double take when he sees her. (That dress later sold at auction for £600,000.) More of the plotting takes place in the gardens beside the Champs-Elysées. Another scene takes place in Maxim’s, where the eccentric millionaire, played by Eli Wallach, tries to woo Nicole Bonnet. The other important location is the Bonnet mansion, a three-storey, nineteenth-century pile with a large forecourt, and a double staircase leading up to the front door. Where is it? 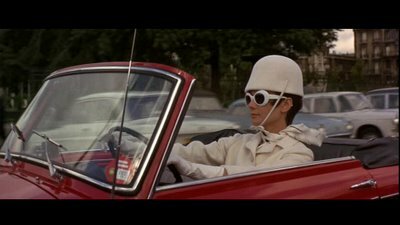 It took me a while to find out, until I discovered that when Peter O’Toole puts Audrey Hepburn in a taxi and tells the driver to take her home to “38 rue Parmentier,” that is, in fact, the address – in Neuilly. Today the house has disappeared, replaced by an apartment block. The wall and the gate of the forecourt are still visible, however. The film’s capable supporting cast included the Welshman Hugh Griffith as the Frencher-than-French Charles Bonnet, the notable French actor Charles Boyer as a gallery owner, and a comical character known only as “Moustache,” playing a museum guard. The chirpy soundtrack is credited to Johnny Williams, who turns out to be John Williams, of Star Wars fame. When it was released, the movie received only lukewarm reviews. It was derivative (the critics sneered). It was not even funny. It was time Audrey Hepburn stopped playing ingénues. Time has been kinder to How to Steal a Million. I must have seen it a dozen times, and it always delights. This entry was posted in Paris film and tagged Alexander Trauner, Audrey Hepburn, Autobianchi Eden Roc, Charles Boyer, Eli Wallach, French schedule, Givenchy, How to Steal a Million, Hugh Griffiths, Maxim's, Moustache, Musee Jacquemart-Andre, Neuilly, Peter O'Toole, Ritz, William Wyler. Bookmark the permalink. I loved this film then. And just having returned from Paris, I intend to see it again. You have obviously got a copy of it but is it available in video stores? OK, so it’s not Citizen Kane but it’s one of the best feel-good movies of all time. It’s full of quotable quotes, it’s stood the test of time and 40something years later, it’s still fresh and vibrant. The actors have chemistry, the shots of Paris and the French ambiance are good and I watch this over and over and never tire of its clever dialogue and the eye candy that Audrey and Peter provide. Thanks for all the background info. Yes, the film is available on DVD in the North American format and we are the proud owners of a copy which we would save from a burning house. This movie is a family favourite, and has long been my favourite Audrey Hepburn film. Is that sacrilegious? I know I should like others better, but this is the one I return to time and time again. Thanks so much for the detailed recap – you’ve made me want to go and rewatch it for the 10th time! Interesting to hear that some of the exteriors were shot at the Musée Jacquemart-André. I had never been there before, but my friend and I went a fortnight ago when we were in Paris. I didn’t recognise it from the film though. I totally agree with you about how well this film has stood the test of time. Peter O’Toole and Audrey Hepburn are both at their attractive best, which is saying something, and the supporting cast is impeccable. A real escapist romp! I think I saw this a million years ago. Time to see it again! What’s not to love ~ Audrey, Peter & Paris! I just saw the movie, the museum “Musée Kléber-Lafayette.” Is Musée Carnavalet in 23 Rue Sévigné. Good Movie! Glad you enjoyed the movie. I don’t think it’s the Musee Carnavalet, which doesn’t have those big arched windows. Most people agree that it’s the Musee Jacquemart-Andre. I guess they used two locations. Clever of you to spot the location. I adore this film. I’m so sad that beautiful house was torn down, although I imagine it would cost a fortune to maintain. William Wyler was a great admirer of the work of legendary director Ernst Lubitsch, who died thirty years before How To Steal A Million was made. After Lubitsch’s funeral, equally legendary Billy Wilder lamented, “No more Lubitsch.” Worse than that, corrected Wyler, “No more Lubitsch pictures.” It took three decades, but I think Wyler made the last Lubitsch picture in loving tribute to his friend.